Deck boxes are a necessity these days. In fact, a modern home is never complete without at least one of these incredible outdoor storage devices. Whether it’s your kid’s toys or those games equipment you want to store safely, deck boxes come in handy to ensure that you don’t have stuff scattered all around your home. Inasmuch they don’t fully keep unauthorised access at bay; they ensure that people do not access your personal items at a snap of a finger. And yes, they also keep your items away from water and effects of the sun. Lately, the demand for deck boxes has been exploding and so has the supply. Given their enormous numbers, settling for the best ones is slowly becoming a gambling affair with very strange odds. In fact, chances of taking a dud home are higher than those of getting an original deck box. However, with big names like Suncast and Keter Brightwood, you can never go wrong. If you want to get the picks of the bunch, below are 10 best-rated deck boxes that should be considered for buying. Suncast, as you will find out later, is a big name in the industry. With numerous top level deck boxes on the market, I’d blatantly call them “the market-leaders”. This DB7000W model boasts a 73-gallon capacity which makes it ideal for storage of almost everything. This is a storage box which comes with carrying handles and great wheels to come movement a snap. And yes, with an easy assembling process, you can have everything ready in second. In fact, everything snaps together instantly ensuring that you have your items secured without having to cal for assistance from any other member of your family. The box comes fully packed with no need for you to get extra items or tools in its construction. This, in turn, slashes down the cost you’d have incurred getting those extra needed tools and assembling equipment. If you want to have the complete security of your items, this is your bet. Its extremely durable resin material makes it incredibly amazing and quite adorable. It comes in a perfect size. It can withstand foul weather conditions. The wheels and handles make its movement a snap. Suncast comes again at the 8th position. I mean, this company is at the front-line in the manufacture of great storage boxes. Perhaps I should just let you read on and discover that yourself. By the time you’re done reading the article, you will resonate with me that this is a five-star company. The DB5000 model has a close resemblance to its earlier brother on almost every aspect. Of course, the quality is excellent. 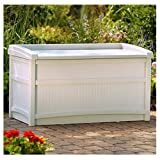 This box can be used for storage of garden items and tools as well as in the safe keeping of athletic and outdoor dining decor. In a jiffy, there’s no limit to the items you can place in this box. The poly-resin construction ensures that you have years of safe storage of your stuff. And yes, its excellent construction offers unmatched resistance to rusting and fading. This means that you will have your box looking good as new for years. The carefully and keenly constructed lid allows rainwater to flow out quickly and conveniently thus keeping it dry at all times. The sturdy hinges which hold the cover keep your items safe and secure from unauthorised access. The straps offer easy opening of the lid for you to take out your stuff. Assembling process is a snap. It boasts up to 50 gallons capacity. Keter Rockwood is what I’d call “a worthy rival” for Suncast. As you will find out later, the market for deck boxes appears to be a two-horse race with a plethora of spectators and some weak opponents. 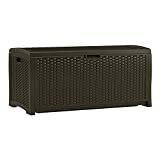 That being said, Keter Rockwood deck box is a plastic and weather resistant product designed to offer ultimate durability. It keeps your items sufficiently dry and well ventilated thus ensuring that they are in a tip top condition. It never warps stains or peels regardless of the situation and weather conditions it’s exposed to. This means that you don’t have to spend sleepless nights worrying about your items. Of course, it’s a maintenance-free item which doesn’t call for constant painting or cleaning unless you wish to do it. It boasts an elegant wood panel design which is not only functionally superb but also quite attractive. In a jiffy, this box is a perfect representation of beauty and performance. It offers an easy opening mechanism. It’s quite versatile; can be used to store large cushions and garden tools. The piston might develop issues if not well-maintained. Suncast once more makes a triumphant come-back! This DB5500 model boasts a long-lasting resin construction which makes it quite durable. Ideal for storage of all furniture cushions and outdoor accessories, this deck box is a must-have for anyone with a plethora of items lying around their compound. Offering a unique combination of excellent design and unparalleled performance; this deck box is simply amazing. If you want to have your items surely stored without fear of interference and contamination from uninvited personals or unfriendly weather conditions, then this box is your number one bet. It offers easy and quick assembling with no tools required. It boasts a stay-dry design. It’s a bit too expensive. If you love outdoor activities but aren’t fascinated by the idea of having sporting items lying around your compound, then this is a beautiful storage box for you. Keter Brightwood is a name you can rely on when it comes to construction of top tier boxes. Boasting a size which is ideal for the storage of various items, this box is simply amazing. Of course, it not only offers an excellent storage space but also doubles as a seat for you to bask in the sun without having to carry seats out. Its automatic opening mechanism makes opening a piece of cake. And yes, the mechanism also makes closing falling off a log. The durable and weather-resistant resin makes it quite impressive. It offers several colour options. The wood panelled design is quite attractive. It’s Suncast at it once more! This DB8000B model, just like all its previous and next brothers, boasts an excellent performance and durable construction. At this juncture, I feel like I have to let the cats out of the basket and disclose the item which scoops the top position. Unfortunately, that will spoil the suspense which isn’t in my best interest. I will, however, hint that the race will be between Suncast and Keter Brightwood. That said, this box features a 73-gallon capacity which makes it quite surprising. The wheels and handles offer hassle-free movement while the easy assembling design males it quite impressive. It has adequate interior space. Its attractive design makes it quite appealing. Snapping it together isn’t so easy. Similar to the previous item, this DBW7300 model of the famous Suncast brand offers a capacity of 73 gallons. 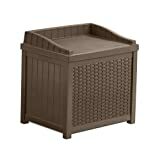 It’s ideal for storage of cushions and every other patio accessory you’ve got. It provides quick assembling process with no tools being required. The design with handles and wheels guarantees adequate mobility. If you’re looking for an excellent yet inexpensive box, this could be your bet. The Mocha brown exterior offers an authentic appearance. It can also serve as a seat. You cannot disassemble it once you assemble. It’s Suncast all through! This DBW9200 deck box is simply amazing. It features a 99-gallon capacity which makes it ideal for all your storage needs. Its easy and instant assembling ensures that you don’t scratch your head trying to put pieces together. In a nutshell, the design is unmatched, durability is unmatched, and its capacity is a thumbs-up. The contemporary design adds to your home decor details making it more of a decorative aspect. It comes with handles for easy movement. The plastic construction isn’t ideal for a sunny climate. Finally, Suncast SSW1200 takes the top position. Just like you had guessed, this box features incredibly impressive features. It has an overwhelmingly positive rating on Amazon. And yes, if its unique design and durable construction is anything to go by, then you can never go wrong with it. It’s ideal for indoor and outdoor use. It comes in a contemporary design to add to your patio decor. Its 22-gallon capacity isn’t so great. After knowing 10 best-rated products, let me give you some factors that we need to consider before buying them. This is to ensure that you choose the right one that best describes your need. Your deck box is as good as the material used in its construction. Unless you want to have a flop, ensure that you go for a deck box made using a sturdy material. The conventional materials employed in the construction of robust and durable pack boxes include reinforced plastics and wood. We also have some hard deck boxes although they go for a very high price. Of course, if you want to get a beautiful and durable item, you might have to pay more. Depending on the number of items you want to store, consider the size of any deck box before buying it. I have personally learnt the hard way that failure to find the size might prove quite costly. Imagine bringing a box home only to realize that it can’t hold everything you wanted to put inside it. And yes, although you might be offered an opportunity to return, this is also an added expense on your part. For that reason, spare yourself the headache and take note of the size before making a purchase. You never want to get a deck box or anything for that matter, only to realize that you can’t put it together. We all want to be able to assemble our item in a snap of a finger. For that reason, ensure that you pick a box which can be assembled with utmost ease. This way, you will spare yourself the stress of having to call your friends to help you figure out how to put the pieces together. You should also consider the exact spot you intend to set your deck box. The location will assist in the determination of the size as well as the material of the deck box you buy. I mean, you should also take your geographical situation into consideration. For instance, if you live in places where the sun is extremely high, getting a weak plastic deck box might be a bad idea. At the same time, if you live in areas with too much rain, the metallic deck boxes should boast a stainless material. These are just but a few aspects of a location that you should have at the back of your mind when you’re buying a deck box. The total cost involves every expense that you will have to incur to have your deck boxes in tip top condition. It also takes into account the additional cost you will incur in maintenance. You have to take note of every cost that you will have to foot. This way, you can make an informed decision on which item to go for and which to avoid. Wrapping things up, if you want to get a beautiful deck box, ensure that the quality is a check, and design is a double check. As much as the deck serves its purpose right, it also has to serve a decorative purpose.